Most nights this year, I've attempted to leave the Twittersphere with a chill in its very soul. Just before bed, I often sign off with an attempt at a disquieting goodnight-tweet. It's fun, trying to generate unease with 140 characters or less, and I'm sure I'll continue to do it. After a while, I realised this was good research. I was testing the waters with frightening ideas. Which goodnight-tweets provoked the biggest response from people mock-chiding me for ruining their night? I was paying attention when I looked at those reply tweets each morning, oh yes. 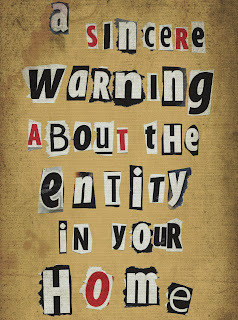 The goodnight-tweet which gained the best reaction has ended up as the fear-engine at the black heart of my new short story, A Sincere Warning About The Entity In Your Home. Over the last couple of months, I've experimented with dipping toes into the Kindle-prose pool. My novella Beast In The Basement is selling well and picking up some great reviews (here's the latest, from The British Fantasy Society), so that experiment seems to be going well. 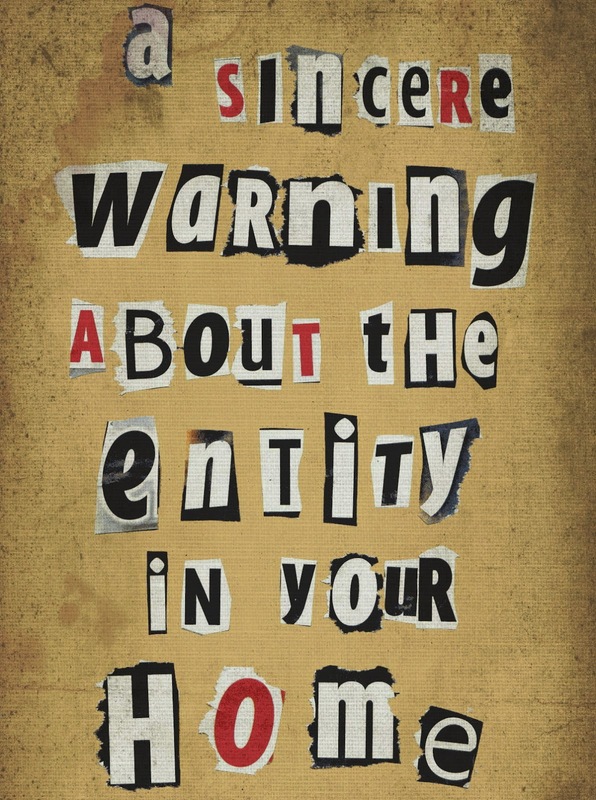 A Sincere Warning About The Entity In Your Home, on the other hand, is a whole other kind of experiment. As you might expect from the title, it's a ghost story: one which takes place in YOUR home. Yes, the place where you, the reader, lives. 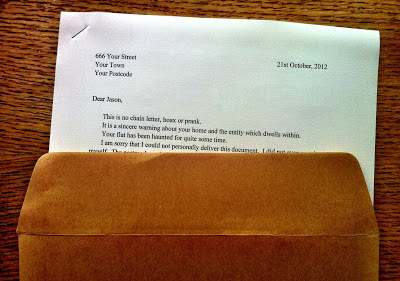 This 10,000-word story takes the form of a creepy letter which arrives at your property, telling you things you really don't want to hear. 1) The Kindle Edition: an ebook on global Amazon sites for 96p (approx $1.49/€1.23). You don't need a Kindle device in order to read a Kindle book. Free apps are available for Android phone/tablet, iPad, iPhone, iPod Touch, PC, Mac and more (details of these apps here at Amazon UK). Why your name and address? Because the text will be personalised in several ways. It will include your first name, eight times throughout. So there it is. Should be an interesting experiment. Will lovers of supernatural horror enjoy a story which is largely set in their home? Will they want to buy a unique, premium item like a 10,000 word story personally tailored to them and delivered in the mail, like real letters used to be? What a great idea. 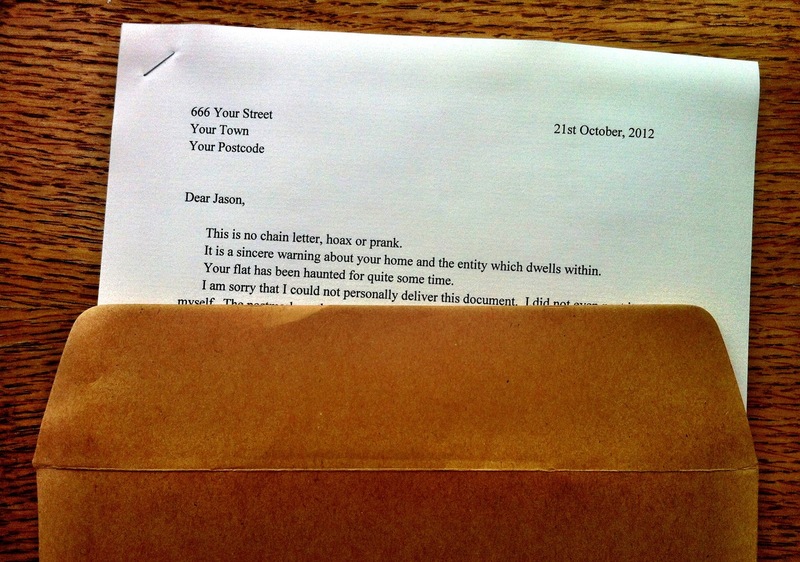 Not only the goodnight-tweet as a testing-the-water methodology but the personalised letter idea. Never seen, or heard, of that being done before.